How to add a new tag-based service to Ranger. 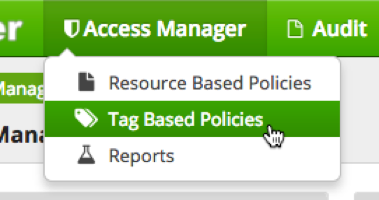 You can access the Service Manager for Tag-Based Policies page by selecting Access Manager > Tag Based Policies. 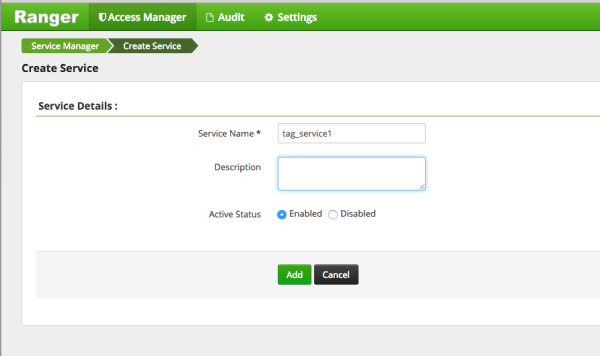 You can use this page to create tag-based services and add tag-based access policies that can be applied to Hadoop resources. Using tag-based policies enables you to control access to resources across multiple Hadoop components without creating separate services and policies in each component. You can also use Ranger TagSync to synchronize the Ranger tag store with an external metadata service such as Apache Atlas. Click the Add icon ( ) in the TAG box on the Service Manager page. On the Service Details page, type in a service name and an optional description. The service is enabled by default, but you can disable it by selecting Disabled. To add the service, click Add. 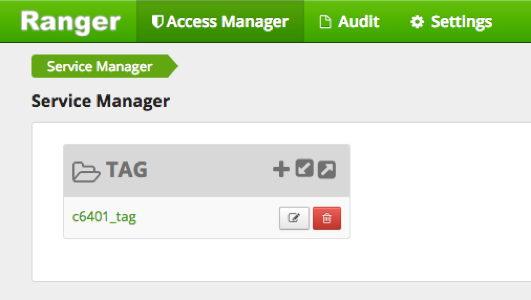 The new tag service appears on the Service Manager page.